The Government has published a factsheet updating landlords of their obligations under the Immigration Act 2014 which means that UK PRS landlords and letting agents have at last been provided with a small degree of guidance on how to go about checking the immigration status of private rented sector tenants. Under the controversial new rules, landlords and letting agents in some UK areas will need to check that tenants have the “right to rent” in the UK before letting a property to them. 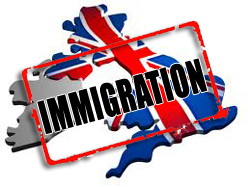 The new factsheet published by the Home Office is called “Tackling illegal immigration in privately rented accommodation” has been eagerly awaited by the property industry since the changes to the immigration bill were announced.UK landlords and letting agents require detailed guidance on how to become unpaid agents of the UK Border Agency in order to check the immigration status of any prospective applicants who may be foreign nationals, however such checks will not be required to be made on existing tenants. Rosalind Renshaw from PropertyIndustryEye.com managed to extract the following few facts from the new Government document, and we thank her for her time and insight. The new factsheet published by the Home Office gives no date for when the requirement will kick in, merely stating “late autumn”. The new factsheet says that landlords, or agents acting on their behalf, will need to make checks in some areas, but does not state where, but then goes on to say: “At first, the requirement will apply in just one area” but again does not state where. The new factsheet gives no hint of how large the pilot area will be, eg – a high street in a specific town or city, or a whole UK region? The new factsheet is vague in some parts stating that: “The requirements may apply more widely from 2015”. The Government says it will announce the trial area in September – but it does not say whether this will be the beginning or end of the month, potentially giving letting agents and PRS landlords very little time to prepare. Yet the factsheet states that failure to comply could result in a civil penalty of up to £3,000 (GBP). Next month, the Home Office will publish draft Codes of Practice, when they are also expected to announce the trial area. Landlords and letting agents will need to obtain an official document such as a passport or biometric residence permit from prospective tenant applicants, in most cases and Landlords and letting agents will need to photocopy these documents to show that the check has been carried out. If landlords and letting agents need to contact the Home Office helpline for immigration status verification, because the tenant has an outstanding immigration application, or because the Home Office already has their documents, a clear yes or no will be provided within two working days. If an answer has not been received within two working days, the letting agent or landlord can go ahead and let the property to the tenant without risk of a financial penalty. The requirement for landlords and letting agents to check the immigration status of prospective tenants is in the Immigration Act. An immigration status checking service for more complex immigration cases. However UK PRS landlords and letting agents should remember that any of the above statements could and probably will be “subject to change”. The new Government immigration guidance factsheet can be viewed by following the link below. This was written by Mike Clarke. Posted on at 11:30 am. Filed under Landlord News. Tagged areas, checks, city, code of practice, factsheet, guidance, Home Office, illegal immigration, immigration, immigration bill, immigration checks, industry, landlords, letting agents, pilot area, private rental sector, Private rented sector, property, prs, publication, region, requirements, right to rent, subject to change, tackling illegal immigration in privately rented accommodation, town, trial area, UK. Bookmark the permalink. Follow comments here with the RSS feed. Both comments and trackbacks are currently closed.